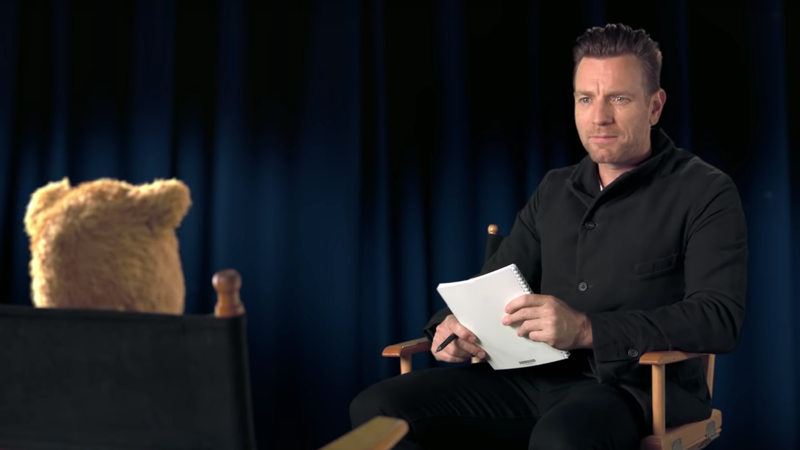 Ewan trying to figure out if Winnie the Pooh forgot his question or is merely dodging. Disney is in the field promoting their latest movie, Christopher Robin, and have even sent out their own star Ewan McGregor to pull some of the grunt work. But let’s just say it’s not easy to interview the residents of the 100 Acre Wood. Christopher Robin’s latest featurette showing McGregor, who plays the titular Christopher Robin, interviewing Winnie the Pooh and Tigger (both played by Jim Cummings), along with Eeyore (Brad Garrett) and Piglet (Nick Mohammed) about their work and process. The short but adorable video travels through the various stages of giving an actual press interview, only with more mentions of honey and naptime. Let’s just say I can seriously relate to McGregor’s pain at trying to keep Pooh on track or getting Tigger to relate to a perspective that’s outside of his own. Christopher Robin is the story of what happened after the human visitor to The 100-Acre Wood grew up and left his childhood fantasies behind. He’s had to replace playtime with work hours, much to the chagrin of his family, including his wife (played by Agent Carter’s Hayley Atwell). Along with Cummings, Mohammed, and Garrett, we’ve also got the voice talents of Toby Jones (Owl), Peter Capaldi (Rabbit), and Sophie Okonedo (Kanga)—though it appears those characters didn’t want to be interviewed themselves. Christopher Robin hits theaters on August 3.